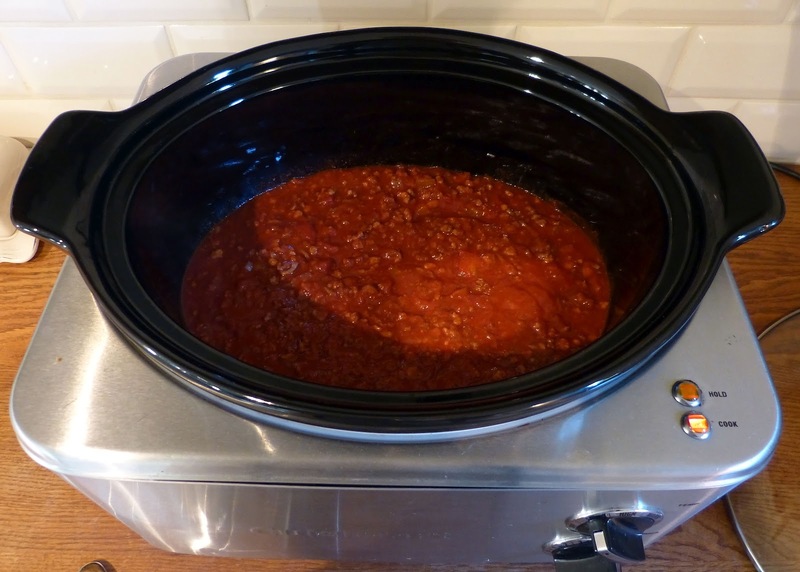 I love my slow cooker, especially at this time of year, the season of soups, stews, chillis and casseroles. It was one of the first items my Mum gave me when I moved out of the family home and to my mind it's an essential piece of kit in any kitchen. Slow cooking releases more flavours and allows ingredients to really meld together. 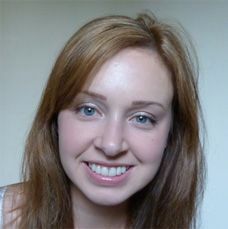 It's also wonderful for meat, including pot roasts as slow cooking allows to you to use cheaper cuts of meat - the long cooking time breaks down and melts all the fat, connective tissue and bone marrow (yummy eh?) to produce amazing gravies and sauces. You can pick up a cheap two-person slow cooker (sometimes called a 'crockpot') for about £20 and they use minimal electricity, so they're economical too. 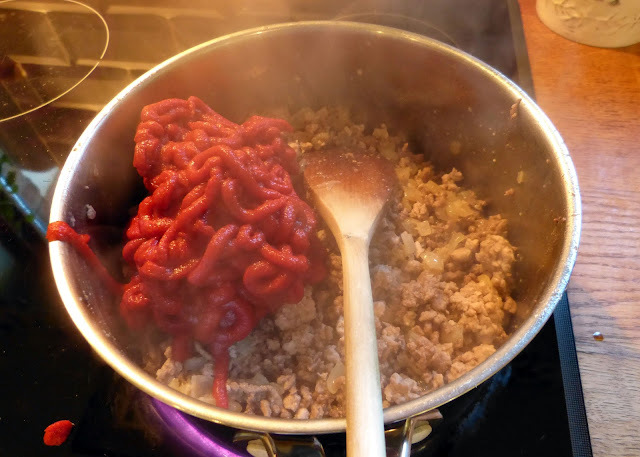 This bolognese is an adaptation of a Delia recipe, I think. 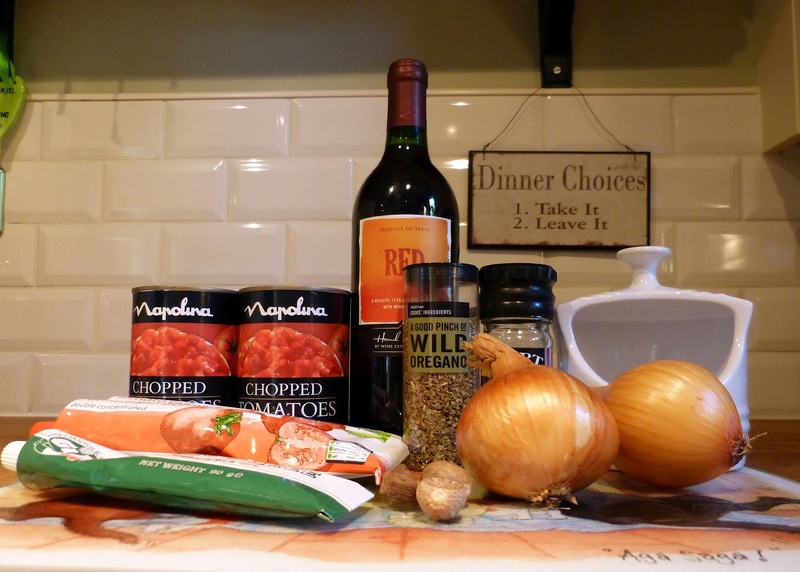 It's meaty and intensely tomatoey and we absolutely love it! 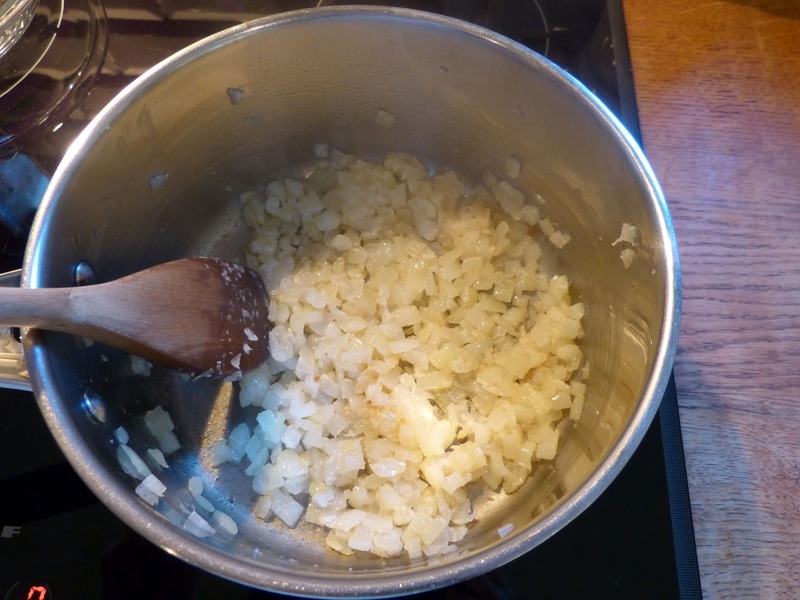 This recipe makes enough for a whole lasagne (with leftovers) or you can split it into portions, bag up and freeze so you always have a quick weeknight pasta based meal to hand. Add another glug of olive oil to your pan and brown the minced beef. 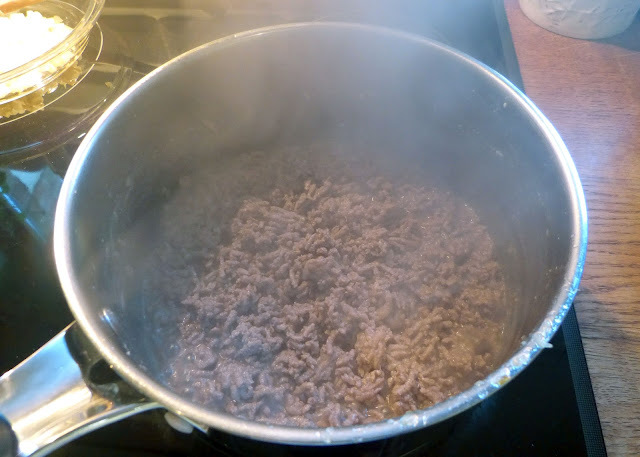 Drain off any excess liquid and set the beef aside.Repeat with the minced pork. Add all of your set aside ingredients back to the pan. Add your red wine, tomato puree and tinned tomatoes and season with your salt and pepper, grated nutmeg and oregano. This is why you need a large pan! Bring to a bubble then transfer the whole lot to your slow cooker. Check seasoning, turn your slow cooker down to LOW then pop on the lid and you're done! I cook it for at least four hours. I make it the day before I want it, as leaving it to cool and steep overnight only improves and intensifies the flavours. Reheat thoroughly and stir through your fresh basil before serving. Eat with fresh spaghetti, sprinkled with parmesan, mozarella or even cheddar. Alternatively, use as a base for a lasagne - either way it's delicious with garlic bread on the side and a large glass of red wine! 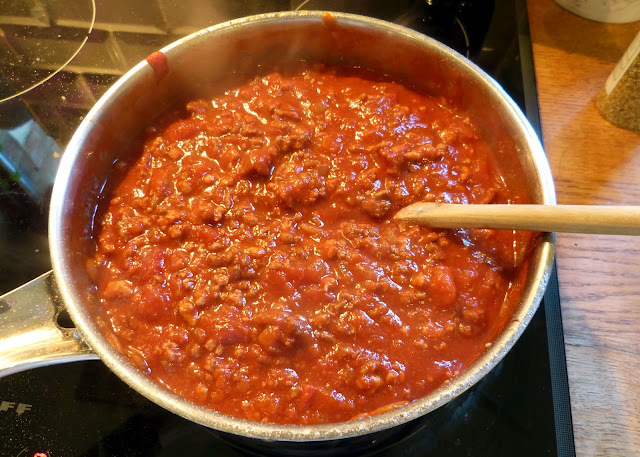 Do let me know if you give this bolognese a try, I hope you love it as much as I do! Ooh, now that it's getting cold I'm going to be getting my slow cooker out again - I'll have to put this on my list of things to try!! I love making my spag bol like this! Any meat stews in the slow cooker taste amazing.